It’s all about creating environments conducive to reaching people in a way that is relevant to our culture and times. These irresistible environments are designed specifically to provide clear next steps in discovering our individual redemptive purpose in life. Our weekend services are crafted to make everybody relaxed and comfortable. Relaxed so that we connect with God, right where we are in our journey with Him. Comfortable enough so that we always feel safe to invite friend. Each area of our church is strategically designed to function this way. Our engine is our Core Values . Our Vision is the fuel that drives us! It’s the place in your home that serves as the welcome area for guests and new friends. 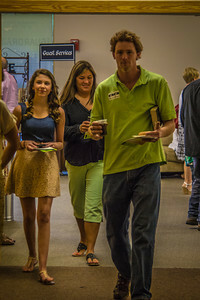 Our weekend worship services are “foyer” environments. We want our guests to come back, so we do everything with them in mind. The foyer is where most people will experience THE GATHERING for the first time, and it serves as the perfect place to introduce newcomers to Jesus Christ and the life of THE GATHERING. This is an open environment where EVERYBODY’S INVITED. Once your guests arrive and are welcomed into your home, you invite them into the living room. This is where you connect with people like yourself. Smaller and more interactive than the foyer environment, this is a real-life, genuine opportunity to begin friendships…just like you would in your home. Growth Track, Dream Teams, Work Days, and more create a Living Room experience. In Living Room environments, EVERYBODY’S INCLUDED. What’s the most happenin’ room in your house? Where do you end up when friends and family come over? The kitchen! That’s the kind of environment we’re striving for in our Community Groups. These groups consist of ten to eighteen people who meet regularly providing a place to connect (relationships), to protect (transparency), and a place to grow (spiritually). This is a safe place to open your heart and share your feelings. This is where lasting friendships are made. It’s about commitment, strength, and security. It’s all about family. EVERYBODY’S IMPORTANT.